A great storm hit Mount’s Bay at about midnight on 6/7 October 1880. It was at its fiercest between about 3 and 7 in the morning of 7 October. 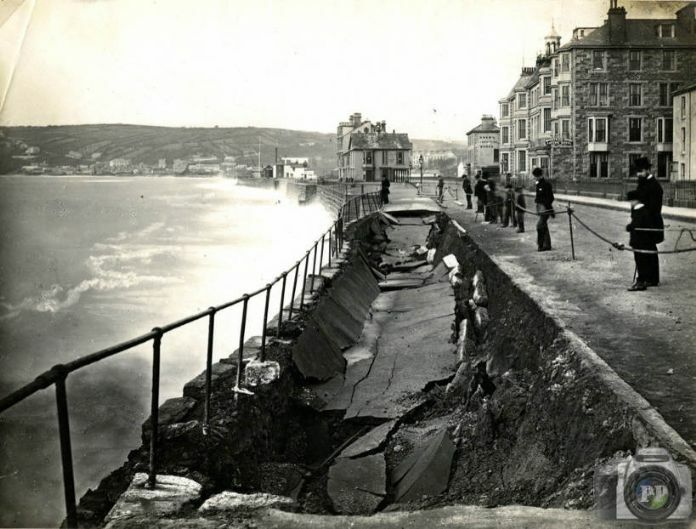 Houses were flooded in Brighton Terrace, large stones were thrown up on the Esplanade, a "beach" formed in front of the Queen’s Hotel, and the road from Penzance to Newlyn was destroyed. Many boats were wrecked in the harbour in Penzance, Newlyn and Mousehole, and the fishermen who owned them lost their boats, their nets and their livelihoods. Particularly poignant was the fate of the Jane, a Mount’s Bay fishing boat returning from Falmouth. Having survived the first eighteen miles of the journey, as she approached Penzance from the Lizard spectators watched her being overwhelmed by a tremendous breaker only 100 yards from the lighthouse. In two or three minutes she was in pieces. For a few minutes two men were seen clinging to wreckage being tossed by the cruel waves, but by 7.10 am they were seen no more. All hands were drowned. Among those who applied at Newlyn Post Office for news of missing friends the next day was the daughter of Jane’s Captain Wallis. She had walked from Mousehole to enquire, and she wished to telegraph to Falmouth to her fiancé, Mr Curtis, a young fisherman on her father’s boat. It was known at the telegraph office and to many anxious awaiters of news there that the Jane had gone down, but no one had the heart to tell the poor girl that in a few minutes she had lost both her father and her future husband.